I’m on a quest to find a quick, nutritious breakfast. Let me qualify that a little. There’s a few other criteria it has to meet, along with being fast and good for you: It has to have some protein in it, it needs to taste good alongside my morning coffee and, ideally, it should be free of gluten. Seems simple enough, right? Well, not really. On the breakfast-y protein front there’s eggs, cottage (or other) cheese and yogurt. I like eggs well enough, but I don’t want to eat them every day. I do like cottage cheese, especially with fruit, but it doesn’t match very well with my coffee. And yogurt? It’s never been my favorite texture, unless copious amounts of granola are mixed into it. When Alan told me that we were going to go pick blackberries at Vanier park, I was, frankly dismissive. Half of Kitsilano is in easy walking distance of Vanier park, and any blackberries there would surely be picked over. So I only brought three small containers that I could hide in my backpack, not wanting to arrive with a bucket at a show that was already over. The whole wild area of the park, on the trail that winds east from Chestnut street, then north to the boat yard and the water, has been taken over by blackberry bushes. And there were plenty of ripe berries, especially in two zones: the ones you can get if you’re willing to squat, and the ones you can get if you’re tall and have a long reach. Between us, we covered both possibilities, and could have filled our containers three times over, easily. And they were good berries, the kind that confirm my belief that a good blackberry is better than any other berry, period. Being able to walk to the berries and home again was an added pleasure. Free food within walking distance? No wonder I’d had my doubts. Later that afternoon Mary came over to work on the Yoga on 7th website, and staying for dinner. Mary, Alan and me: a family that’s been forming over the past 10 years of running the studio together. So I was planning a simple family dinner, with a simple family dessert. 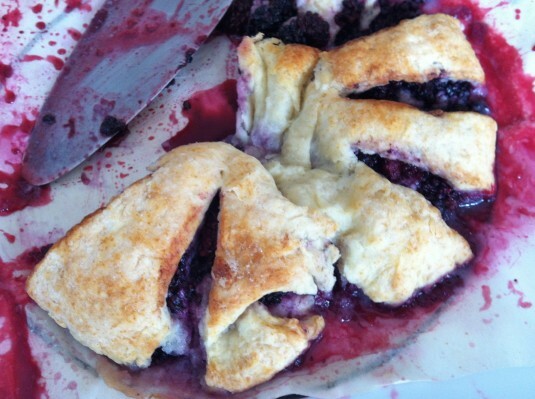 I’ve wanted to make the Canadian Blackberry Roll again ever since blackberry season started. It’s an old-fashioned recipe, one that I made while doing promotions for the Edith Adams Omnibus, a collection that came out in 2005. Edith was the Betty Crocker of the Vancouver Sun, the newspaper where I spent 10 years as a food writer. She specialized, in the early days at least, in printing recipes from readers, and this one, printed in the 12th annual prize cookbook, published in 1948, came from Mrs. N. P. Frost, of Abbotsford. Being an old-fashioned dessert, it’s simplicity itself to put together, just a standard biscuit dough, rolled out into a rectangle, spread with melted butter, sprinkled with sugar and blackberries, rolled up like cinnamon buns, and baked. The list of ingredients is short and the only thing it asks for that you wouldn’t naturally have in your pantry is fresh blackberries. I added an extra half-cup of berries because the two cups called for seemed scant. In fact, the extra half-cup probably contributed to the two breaks in the dough that appeared as I was shaping it into a circle – the recipe below is for the original amount. In fact, it didn’t matter at all. 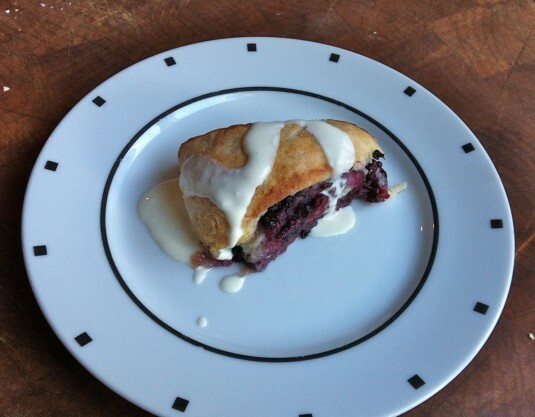 Yes, more juice came out into the pan, and there was no question that the blackberry roll wasn’t going to come off the parchment paper, but it still looked, and tasted, fantastic, with a pure, clear taste of blackberry against the biscuit. We had it with crème fraîche instead of the recommended milk or cream. And I used butter instead of the “shortening” that was called for. For the gluten-free majority in the family, this ought to work just fine with a gluten free dough – the one you used in your cinnamon buns seems like a natural candidate. 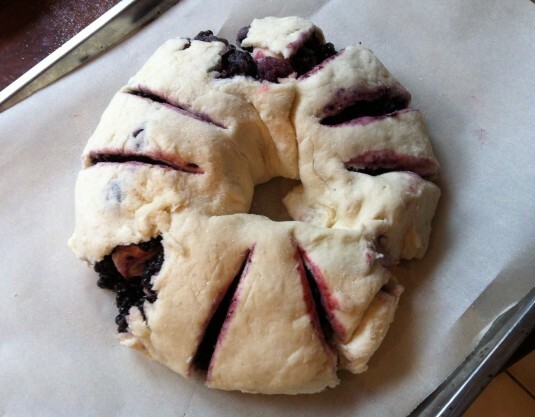 Because I can’t for the life of me think what’s especially Canadian about it, I vote we re-christen the recipe Old-Fashioned Blackberry Roll. Preheat oven to 425 F. Line a jelly-roll pan (a cookie sheet with sides) with parchment paper. Combine sugar, blackberries and lemon juice in a bowl. Set aside. Combine flour, baking powder and salt. Cut in butter, add milk to make a soft dough. Roll out into a 12 by 14 inch rectangle about 1/8 inch thick. Spread the dough with melted butter. 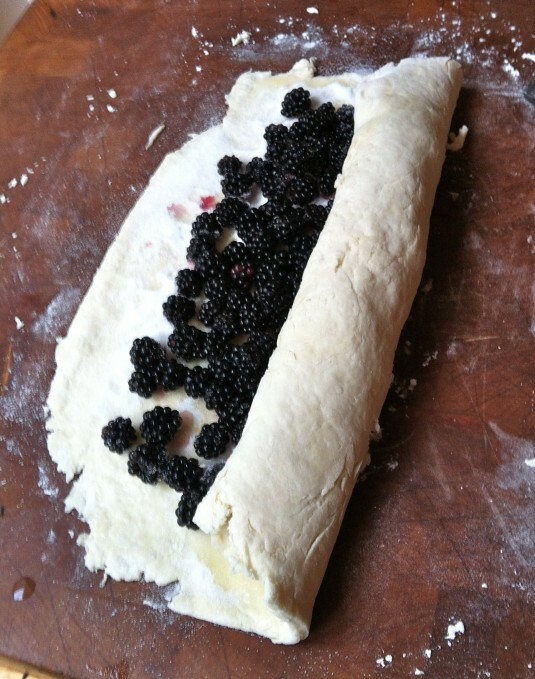 Cover dough with the berry mixture, leaving an inch along each of the long sides. Starting with the long side, roll the dough up like a jellyroll, pinching the ends of the roll closed. Transfer the roll onto the parchment paper. With scissors or a sharp knife, cut the top crust of the roll at 3-inch intervals. Sprinkle the crust with a tablespoon of sugar. Bake for 25 to 30 minutes, until lightly browned. Serve warm with ice cream, whipped cream or crème fraîche. Final day of the challenge. Big sigh. It’s been up and down for the last few weeks — my feelings about Paleo eating, my weight, my anxiety levels about what to do for dinner (not the big questions in life, I realize) — and I’m glad the challenge coming to an end. There are a number of positives I’ll take away, no question. But today, the last day, it’s about my quest for making a Paleo-friendly bread, something that has eluded me so far. 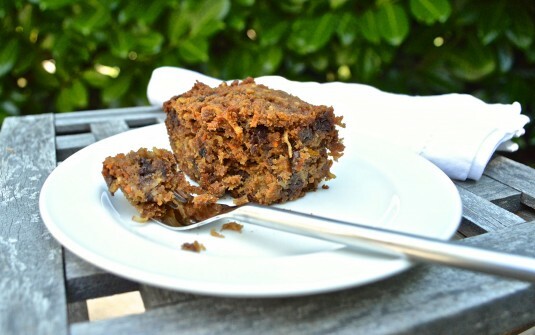 I wish I could say that, after trying a number of recipes and combinations of Paleo-friendly flour substitutes this month, I found a killer recipe. 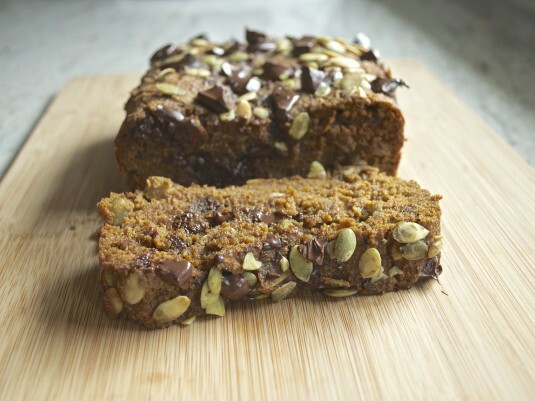 A Paleo bread that I could toast up and enjoy, if not with peanut butter then with another nut butter, to make it like the pre-challenge breakfasts I used to have. Yeah! 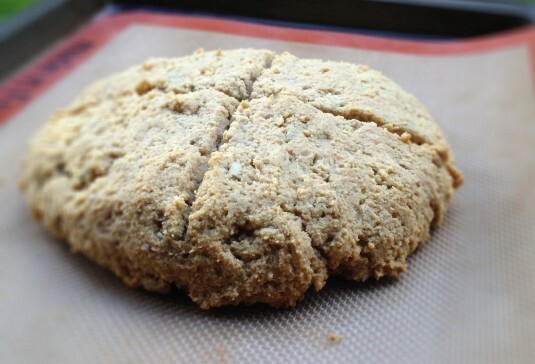 The recipe I settled on was for Paleo biscuits, and overall it was pretty decent. The biscuits were moist and had a good crumb, and they toasted up quite well. Score! (They did stick miserably in the muffin cups though, despite being well greased. I had to chisel them out with a knife, which was not fun. Arg). 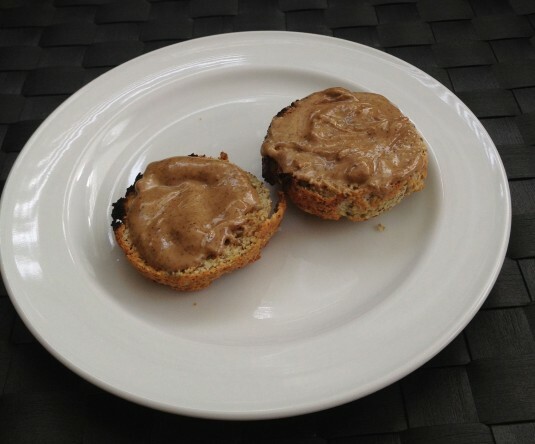 I toasted one up and topped it with almond-cashew butter. Morning coffee at my side, I had high hopes that this biscuit would be the one to replace my beloved (wheat) toast. Another big sigh. Turns out it was just not meant to be. It’s not that I didn’t like the Paleo biscuits. It’s that they weren’t amazingly good, either. As a former baker and lifelong pastry maker (and eater), I realize I’ve set the bar for good bread fairly high. That doesn’t mean that it’s not possible to make a great Paleo bread, just that I haven’t found the right recipe. But I like a challenge, obviously. On the Paleo bread front, we’re not done yet. With the challenge coming to a close, I’m going to take a few days and gather my thoughts on what I thought of it all, the good and the bad. Stay tuned. Oh, wow. Wow. I think I’ve found a new ally in the kitchen, for baking anyway: Blanched almond flour. 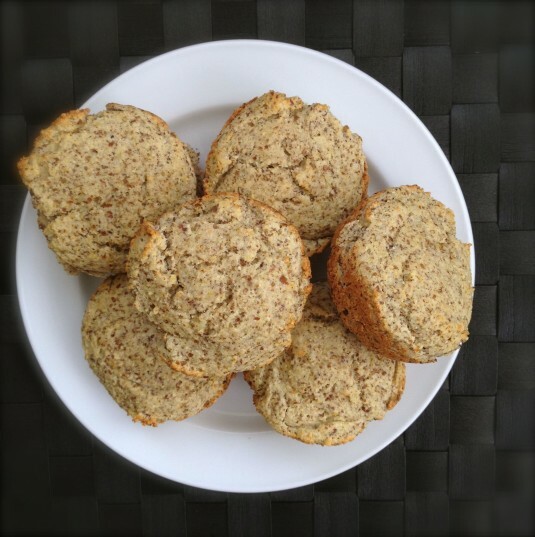 So far I’ve had success using a coarser almond meal in the morning glory muffins, where a denser texture is perfectly okay. But for some baked goods, a finer grind, something closer to actual wheat flour, is what’s needed. I hadn’t had any luck in local stores trying to find this (which I thought was odd, considering I was trying places like Whole Foods, Galloway’s and Famous Foods). 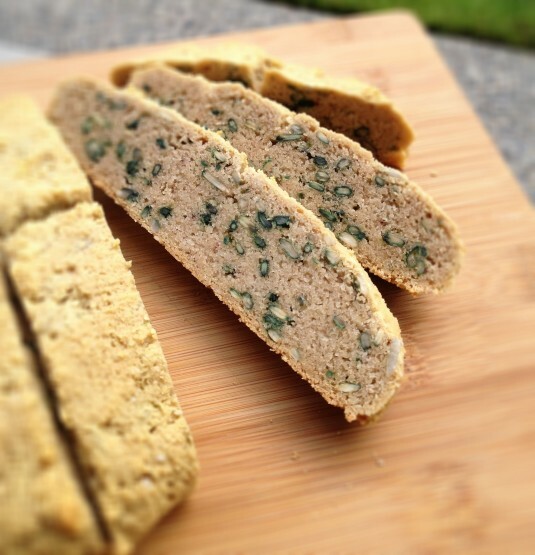 When I spotted a recipe on the Urban Poser blog for Paleo cinnamon rolls that looked absolutely delicious, finally I was motivated enough to get my credit card out and place an order online for the blanched almond flour. The blanched almond flour is super fine, noticeably finer than the almond meal I’d been using. I made a few changes to the cinnamon roll recipe, but they turned out really, really ridiculously well. Better than I expected. I love it when that happens. They’re definitely not like the stretchy pull-apart kind of buns, like the ones I devoured when I was at UBC. These were more biscuit-y for sure. But they were soft, and, with the cinnamon-honey-pecan center, they were so good that I didn’t care about them not being so soft and stretchy. Not one bit. 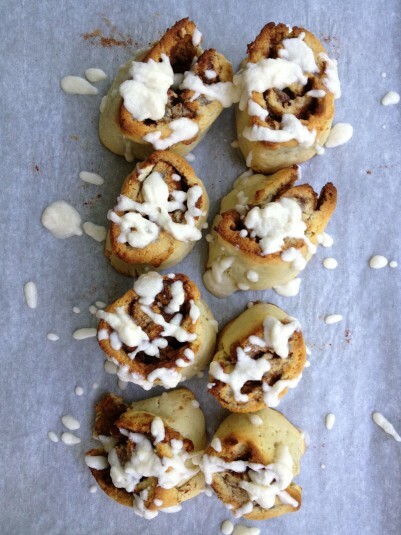 I agree -- these are the best cinnamon rolls around when you're going Paleo. This recipe is adapted from The Urban Poser. In a large stand mixing bowl, combine the almond flour, salt and baking soda. In a separate bowl, beat together the coconut oil, honey and eggs. Add the egg mixture to the almond flour mixture. Blend together with the paddle attachment until the dough is smooth. It will be quite sticky. Sandwich the dough between two large pieces of parchment paper. With a rolling pin, roll out the dough into a rectangle, approximately 9×13 inches. Peel off the top piece of parchment paper. Drizzle the honey evenly over the dough, then spread the honey out with your hands so that it covers the whole surface. 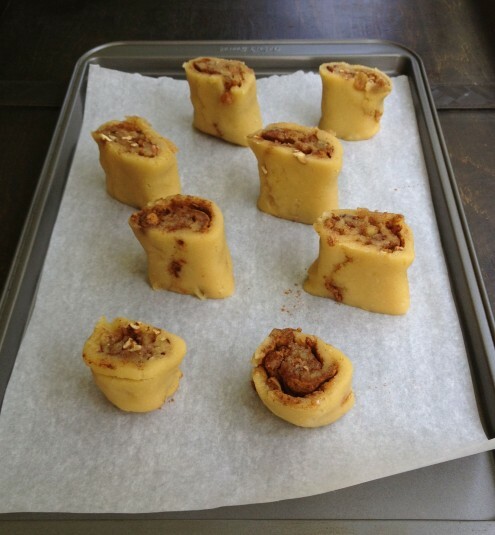 Sprinkle the chopped pecans and currents or raisins (if using) evenly over the dough, then sprinkle the cinnamon on top. Starting at the long edge closest to you, carefully roll the dough like a jelly roll, keeping it as tight as you can at the beginning. The dough isn’t elastic like a wheat dough, so go slowly and gently, patching up small holes in the dough if you get them. Once the dough is completely rolled up, even it out a bit with your hands, being careful not to tear the dough. With a serrated knife, cut slices about 1-1/2 to 2 inches thick. Lay the rolls cut side down on a parchment lined baking sheet. Bake for 12-15 minutes, or until the rolls are golden on the top and the dough in the center of the rolls is soft but not doughy. Remove the rolls from the oven and let cool on the baking sheet for 10 minutes. Transfer them to a cooling rack and let them cool completely. When you're ready to cut them from the roll, get a ruler out to measure out even slices so they bake uniformly. If these bake too long, they'll get really hard....like hockey pucks. Watch the oven, and err on the side of having these slightly underdone. It was another Paleo bread attempt today. And while it wasn’t a shout-from-the-rooftops success, it wasn’t nearly the disaster that the first one was. Perhaps I should feel comforted by that. This time I set my sights a little lower, opting for an Irish soda bread that naturally has a denser texture than a bread you’d make for sandwiches. I have some good memories of soda bread, especially one my mom used to make from one of Anne Lindsay’s cookbooks. It makes good toast, that’s what I remember. I had my fingers crossed. The recipe I was using calls for blanched almond flour, but all I had was almond meal (still waiting for my online delivery of blanched almond flour), so it was going to give me a denser result. And did it ever. Despite the baking soda the bread didn’t seem to rise, even a little. It stayed only a couple inches high, and reminded me of a rounded log of biscotti, ready to be cut and baked a second time in the oven. Where I went wrong was thinking that sunflower seeds would be a nice addition, to give a welcome crunch. Big mistake. They did add a crunch, but they took on a greenish outline when baked. (Maybe they do all the time? I can’t remember the last time I made anything with sunflower seeds baked into it.) It made the bread look, well, almost a little creepy. It’s like the bread had gone moldy even before it had a chance to cool down. Or maybe it was something that Martians would enjoy, if they were eating a Paleo diet. It toasted up quite well, which I was most happy about. It didn’t bring all those happy Irish soda bread memories from my childhood flooding back, but it wasn’t too eggy and it didn’t crumble. If I closed my eyes and forgot about the green flecks in the bread, I enjoyed it quite well. With my morning coffee, it was almost like my breakfasts used to be. In a stand mixing bowl, combine almond meal, salt, and baking soda. Add nuts or raisins and mix to combine. Add eggs, honey and vinegar to the bowl, and mix together until the dough has a uniform consistency. Place dough on a parchment- or silicon sheet-lined baking sheet. Form dough into a large, flat circle, about 8 inches around by 1-1/2 inches tall. Using a serrated knife, cut a cross about 1/2 inch deep in the top. Bake soda bread for 20-25 minutes, until it is golden brown. Remove and cool on a baking rack. We’re Eve and Kris, an aunt and a niece. We love food. And while we have a lot in common in our approach, we also have our differences. So why not hash it out in a blog? 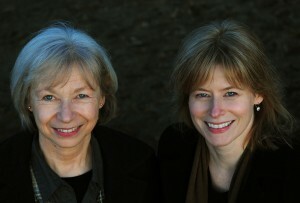 Ant and Anise is a conversation about food in our lives, past and present. We like real food that doesn't take hours to prepare, but has something unexpected about it. It helps if it's pretty, too. Subscribe to Ant & Anise!